Spring vegetables are the star of this gluten-free pasta dish. Whisk together buttermilk, mayonnaise, vinegar, dill, mustard, green onions, salt and pepper. Cook fusilli according to package directions, adding peas during the last 2 minutes of cooking. Rinse under cold water; drain well. Toss pasta with 3/4 cup (175 mL) of the Buttermilk Dill Dressing; stir in radishes and cucumber. Preheat grill to medium-high heat; grease grate well. Stir together olive oil, vinegar, honey, garlic, salt, thyme and paprika; toss with chicken. Marinate for 15 minutes. Grill chicken for 5 to 7 minutes per side or until grill-marked and cooked through. Let stand for 10 minutes; slice diagonally. 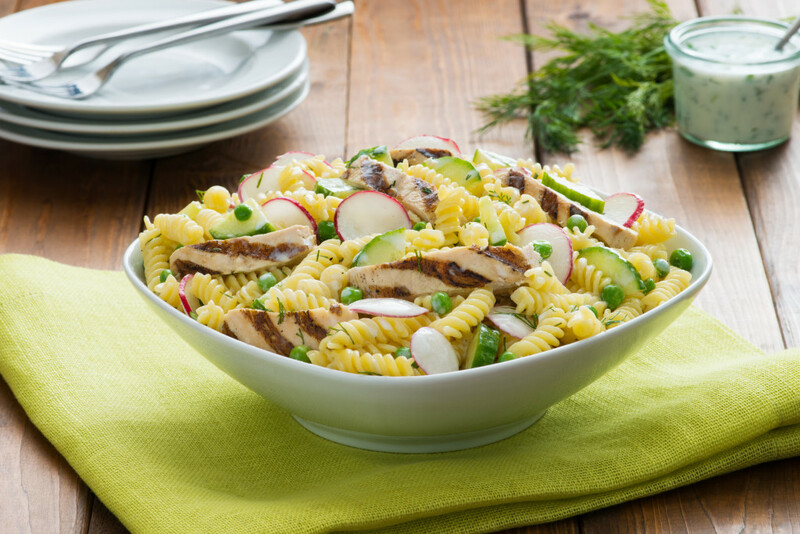 Toss chicken into pasta salad. Serve with remaining Buttermilk Dill Dressing. Tip: Substitute sugar snap peas for peas if desired. 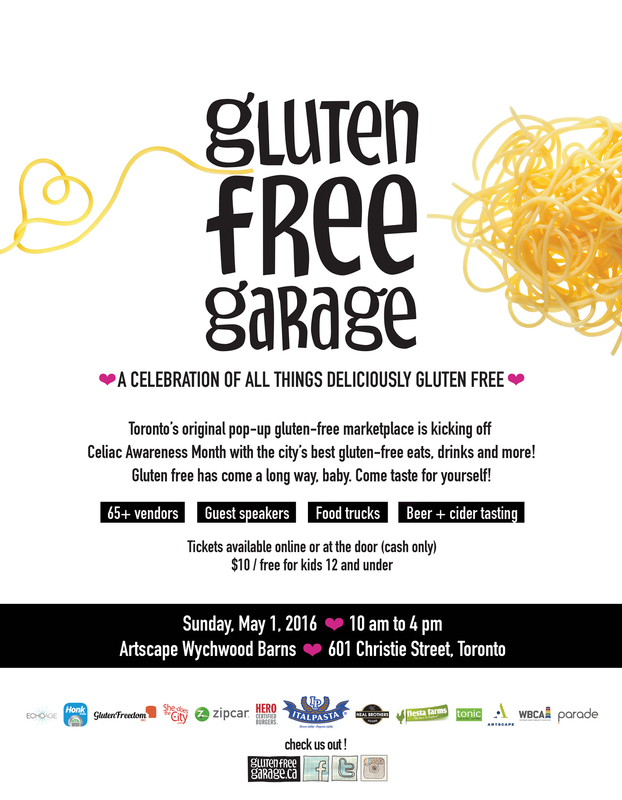 Italpasta is a Gold sponsor of Gluten Free Garage. Posted in GFG exhibitor!, GFG sponsor!, Guest blog, Products we ❤, Recipes we ❤. 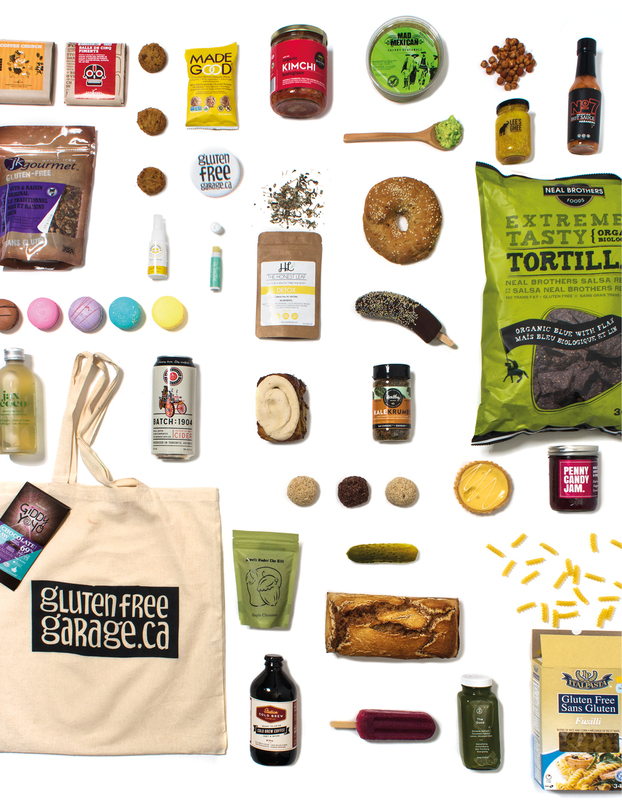 Here’s a sneak preview of some of the products you can score at Gluten Free Garage. We’re handing out free tote bags for your gluten-free loot! For the first 1,000 people who come through the doors of Wychwood Barns on Sunday May 1st. Entrance is on Christie Street. Doors open at 10 am. Our new bags for #GFG16 will also feature the logos of our Gold sponsors Italpasta and Fiesta Farms, the official grocer of GFG. Posted in Bakeries we ❤, GFG exhibitor!, GFG sponsor!, GFG updates, Happiness is..., Products we ❤, Tummy love. 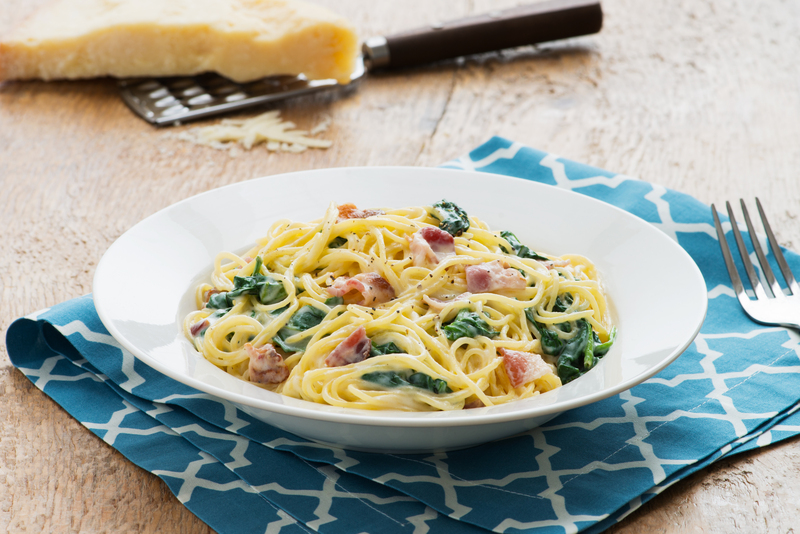 Alfredo gets a shake-up with the addition of bacon, spinach and GF spaghetti. Meanwhile, in large skillet, cook bacon over medium heat for 6 to 8 minutes or until crispy; transfer to paper towel. Wipe pan clean with paper towel, discarding fat. Add cream and butter to pan; bring to boil. Boil for 2 minutes; add pasta, cheese, spinach and bacon. Toss for 2 minutes or until well coated and spinach is wilted. Season with salt and pepper to taste. Serve with additional Parmesan cheese. Tip: Substitute pancetta or prosciutto for bacon if desired. 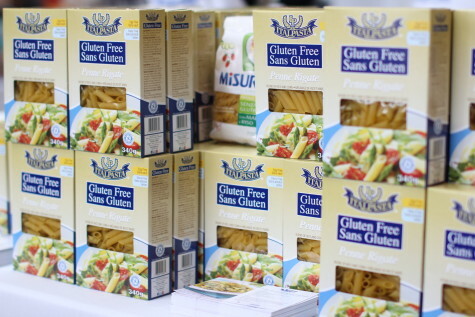 One of my first thoughts after our daughter was diagnosed with celiac disease in 2009 was: “What about pasta!? !” She loved her noodles, and so did I! The day after her diagnosis, we cleaned out our pantry and got rid of every single product that contained gluten. We felt it would be safer for her and easier for us all if our whole house was gluten free. In those first few gluten-free years, we ate rice pasta, which often wound up a goopy mess on the plate and just didn’t taste like the pasta I knew and loved. I was ready to kiss pasta goodbye. And then we discovered Italpasta gluten-free pasta. 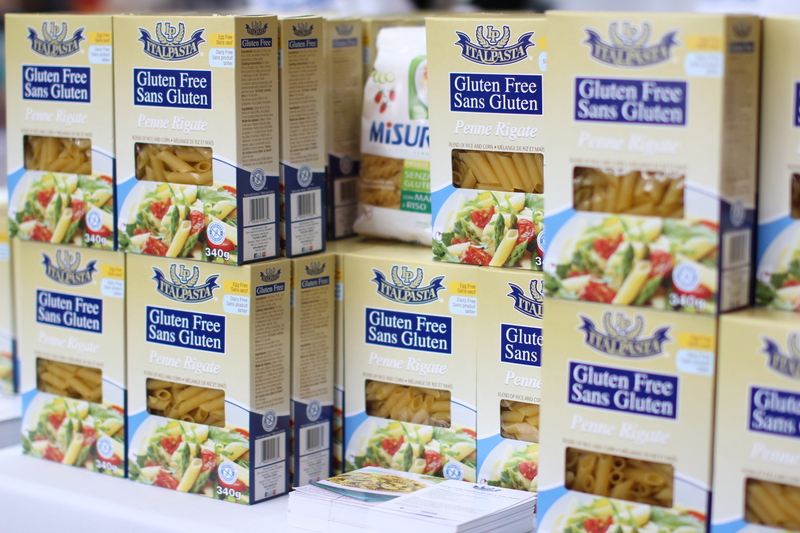 Certified by Canada’s Gluten Free Certification Program (GFCP), Italpasta’s GF penne, fusilli and spaghetti are made from a blend of rice and non-GMO corn. The texture is bang on and you’d never know it’s gluten free. It is now our family’s go-to gluten-free pasta—and, believe me, we’ve tried them all! Italpasta has been a huge supporter of Gluten Free Garage over the years. 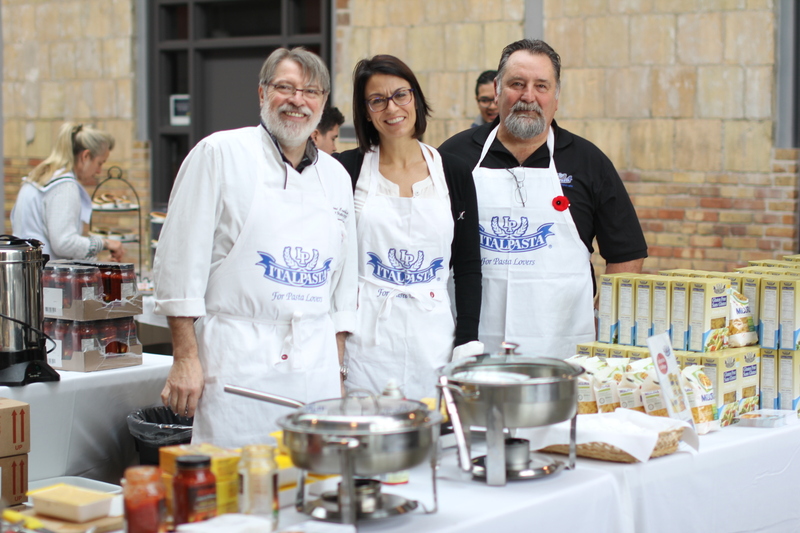 Here’s the team at our last pop-up, from left: Chef Gianni Ceschia, Laura Dal Bo and Perry Battista. 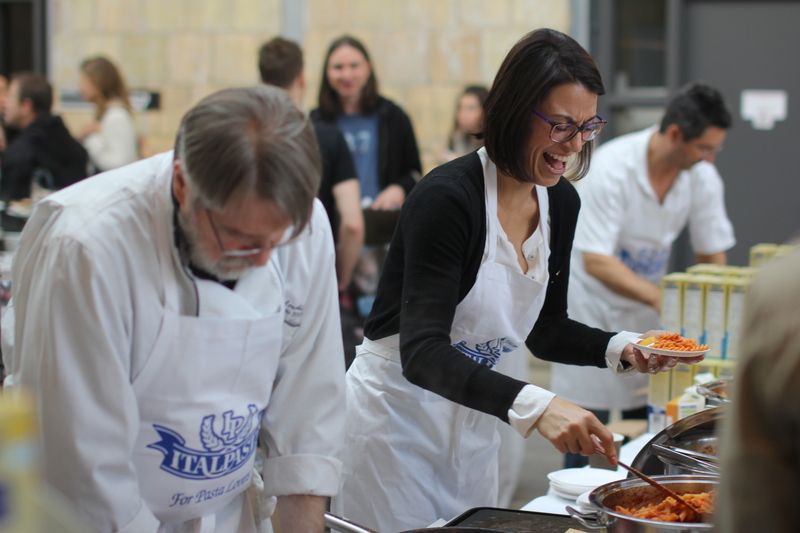 The Italpasta booth at Gluten Free Garage always has a lineup of people waiting to get their hands on whatever delicious dish Chef Gianni is making onsite. 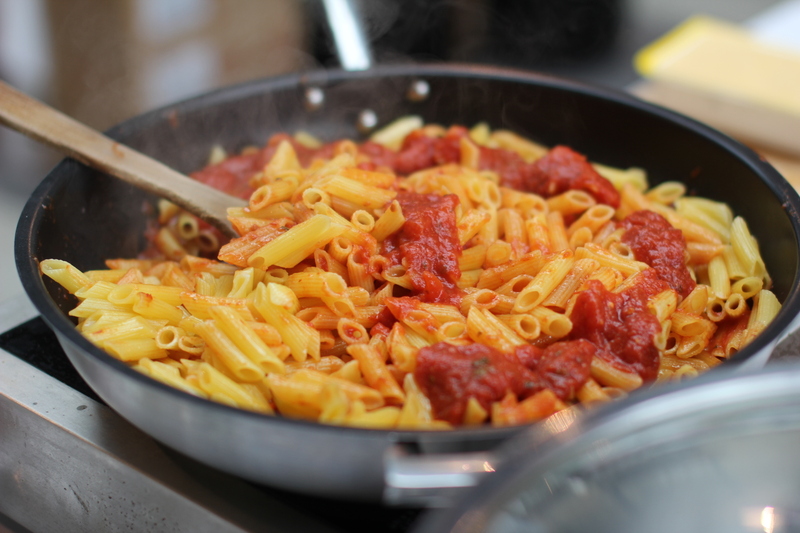 It’s a gluten-free pasta lover’s dream come true! Italpasta gluten-free penne rigate with tomato sauce. And that they do. Grazie, Italpasta. Posted in GFG sponsor!, Products we ❤, Recipes we ❤, Tummy love. Kick off Celiac Awareness Month with us! Posted in GFG exhibitor!, GFG sponsor!, GFG updates, Products we ❤, Stores we ❤, Tummy love.